One of the best things about creating Donor Recognition Art is that we get to meet and support people who are doing amazing things in the world. Our chief installer, Charly Rinn, and I just got back from installing a Donor Wall at Amberwing, a new mental health and chemical dependency treatment center for children and teens in a beautiful wooded area of Duluth, MN. It is scheduled to open this fall. Amberwing is a special project by the wonderful people at the Miller-Dwan Foundation of Duluth. It is rooted in the principles that mental illness is treatable, suicide is preventable, and lives can be transformed with the right help at the right time. The facility will provide intensive treatment using evidence-based practices as well as innovative, holistic care. It will also provide support, education and assistance to parents, caregivers and the community. "A lot of people don't know how to get the help they need — or where to turn for help. There's a world that kids experience that isn't just about 'cheering up.' There's a lot more behind depression. People need the help, but they're so ashamed of it." An Amberwing is a tiny golden-winged dragonfly. As the foundation explains, “Among the most ancient of living creatures, the dragonfly connotes themes of transformation, emergence and flight. Much like a child, the Amberwing dragonfly experiences a metamorphosis as it matures, emerging from the water and taking flight. Its bright colors take time to develop, reflecting the idea that with maturity, our own true colors come forth. This is the second Donor Wall we have created for Miller-Dwan. The first was unveiled in 2007 at their Solvay Hospice House, the only residential hospice in Minnesota north of the Twin Cities. I am proud and touched to be able to support Miller-Dwan in all of their heartfelt projects. I thought you’d enjoy seeing something completely different from us here at Amri Studio -- breathtakingly beautiful carving in stone! We are not only the deepest glass carvers in the country, but we shape and detail the designs with great sensitivity, precision and artisanship. We have carried that skill into the world of stone. Here are some detail shots from a project that just went out the door. It is white marble, with delicate sparkling veins of crystal. You may be surprised to hear that we have been carving stone for more than 20 years. After all, it is the centuries-old tradition of exquisite, hand-chisel-cut stone that inspired us to carve permanent monument-quality “transparent stone” — that is, glass. We have led the way in today’s deep-carved thick glass and crystal. I am an avid admirer of the ancient Greek bas-relief friezes and statuary, and more modern pieces such as the poetic words carved into the Lincoln monument. We did several marvelous pieces of black Quaker slate honoring the Naming Donors for the Ellison Building at Massachusetts General Hospital in Boston. The plaques were done in deep-carved v-cut letterforms that were then filled with 23k gold. The effect of the black and gold together was striking and elegant. 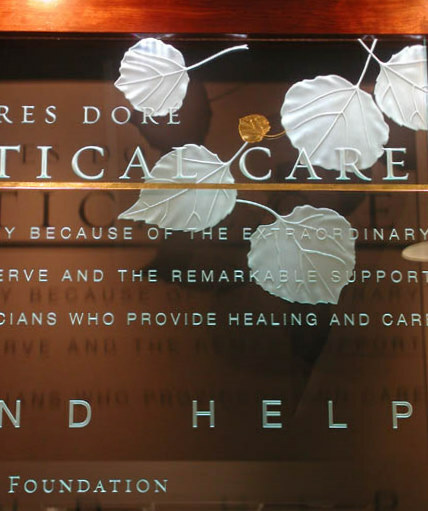 Here’s another example of our stone carving, which we created for the recent American Healthcare Philanthropy conference. On this piece of carrera marble, we created a stone Alphabet book “page” but with deep-carved classic v-cut lettering, then added an acorn with oak leaves attached. These graphic elements are nearly 5 inches high and are side-lit here by a halogen spotlight. In addition to marble and slate, we do deep, bas-relief carving in granite, alabaster and limestone. These pieces are beautiful when used inside (as at Mass General) or outside, in healing gardens, meditation walks, Donor Walls and other memorials. How might how our elegant carved stone might serve your needs? We can carve any motif into stone -- flowers, vines, birds – in fact, anything you see in our glass! Silver leaf or copper/gold add elegant and gleaming accents added tastefully into the carving. Several folks in the memorialization industry are talking with us now and some of our healthcare clients are looking at additions to their hospital Donor areas and healing gardens. Carved stone markers make wonderful permanent and weatherproof landscape enhancements and Donor Recognition for those whose gifts went to creating places of solace like these! Art condenses the experience we all have as human beings, and, by forming it, makes it significant. We all have an in-built need for harmony and the structures that create harmony. Basically, art is an affirmation of life. This is the time of year when I look back on what we've achieved and am filled with gratitude for the chance to work with some extraordinary institutions and equally extraordinary people. In 2010, we created Donor Recognition Art for huge medical research institutions and a 12-bed hospice, for a major university and a small but fast-growing community college in the Ozarks. 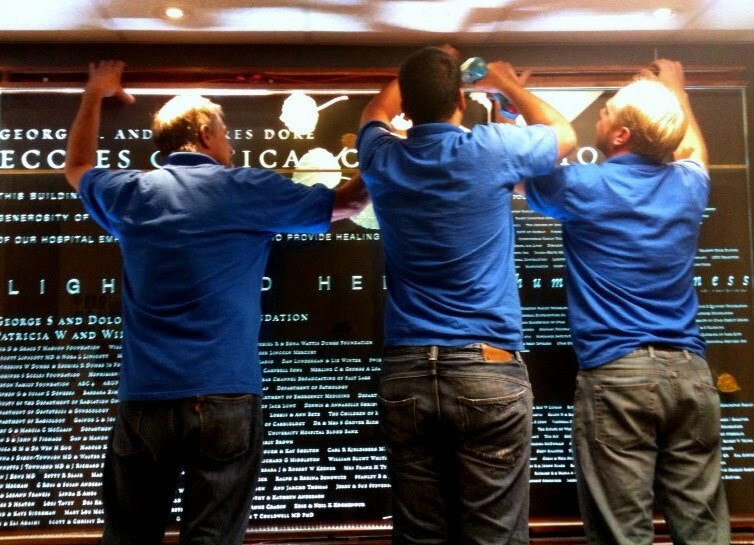 We carved and etched single panels for some clients, and 100-foot-long crystal murals for others. Each of these projects was deeply meaningful for me and my staff. Without exception, we were enlarged by the people we worked with, the causes we learned about, and the challenges we met. Thank you all for the opportunity to practice our art and celebrate your patients, clients, staff members and community of donors! We feel truly blessed! Here is a quick tour of this year's projects, organized by the purpose of the project. At St. Mary's Hospital in Grand Junction, CO, cascading garlands of roses were carefully carved into eighteen crystal panels, while an etched rosary of pearls and gold-leafed beads led visitors from the lobby into the heart of the building. St. Mary’s deeply held values were carved into the crystal along with the names over 900 donors. A crystal wall with individual Donor plaques stretches along a hallway at the amazing Computer History Museum in Silicon Valley. This type of wall is extremely flexible, allowing for many new Donors at a wide range of giving levels. 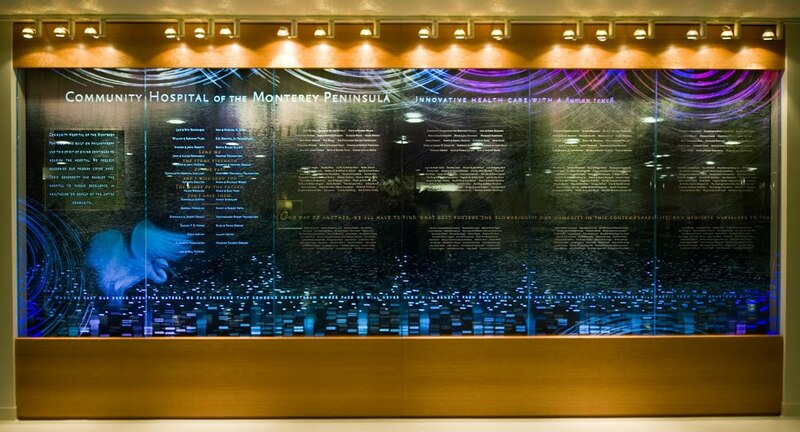 The themes of nature and medical science merge in this Donor Recognition System at the Community Hospital of the Montery Peninsula in Monterey, CA. Floating bars of DNA sequences stacked along the bottom of the crystal panels morph beautifully into patterns of light dappling sunlit waters where an egret is poised for flight. We are always delighted when we are asked back to an institution with whom we have worked before, and this was the case at the Eccles Critical Care Pavilion of the University of Utah Hospital. In 2002-2003, we created a very large Donor Recognition System for them, on which we carved the names of some 2,800 Donors -- every single person who made a donation, from local philanthropists to the hospital janitor! This year we created a smaller "sister" wall to honor yet more donors, who funded the hospital's airy new two-story lobby. In creating this new wall, we used the same materials –- carved crystal and gold-leafing -– the same theme, and the same design vocabulary so that the two walls would have artistic unity. The University of Miami Alumni Association asked us to design Donor Recognition Art that celebrated the Donors who enabled them to build a beautiful new Alumni Center. 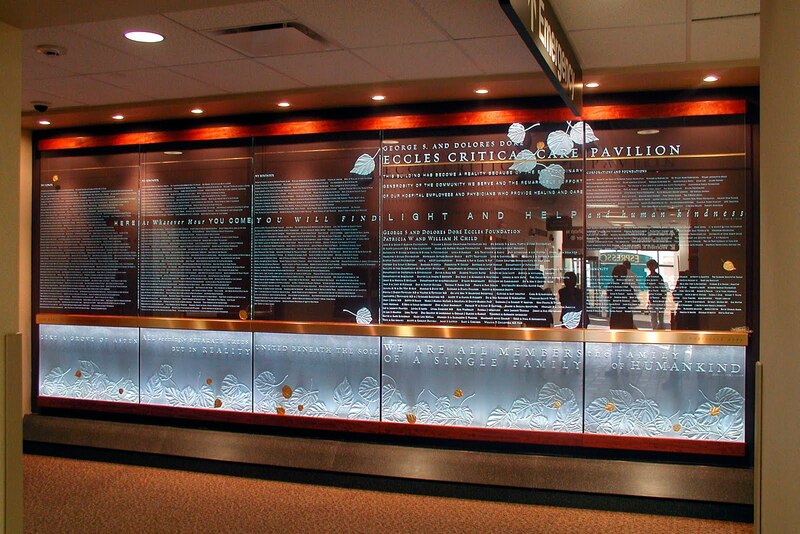 We created a grid of interlocking crystal panels deep-carved with Donor Names. A rendering of the new Robert and Judi Prokop Newman Alumni Center, designed by the celebrated architect Michael Dennis, serves as the backdrop. At the NorthWest Arkansas Community College in Bentonville, AR, we carved and etched Donor Recognition Art to honor Donors to their Building for the Future Capital Campaign. We used lacy silhouettes of young trees as the background to the Donor Names. These trees characterize the local landscape near the college and reflect the youth coming to college. There are some individuals so blessed -- and so generous -- that they are able to make very large donations to the institutions they believe in. We had the honor this year of creating tributes to three such individuals. The first was Abra Rockefeller Prentice Wilkins, the Naming Donor for the Prentice Women's Hospital in Chicago. Mrs. Wilkins is one of Chicago's most treasured philanthropists and an energetic advocate for women’s health. Her donations first established the hospital, then enabled its expansion and move into a state-of-the-art facility that contains one million square feet of top-notch healthcare for women and children. At the renowned Children's Hospital of Philadelphia, we created a tribute to Ruth M. and Tristram C. Colket, Jr., whose lead donation enabled the building of the new Colket Translational Research Building. "Translational research" is medical research that is focused on dramatically shortening the time it takes for a scientific discovery to be "translated" into medicine that can heal people -- and this world-famous hospital is a leader in that field. In Ohio, our hearts were touched at the opportunity to create a tribute to Benjamin and Marian Schuster, Naming Donors for the Schuster Heart Hospital. Dr. Schuster is a longtime heart specialist and his wife was a major supporter of the arts in the Dayton area. The Schusters were known in their community almost as much for their love of each other as for their contributions to the community. To honor this aspect of their lives, we overlaid some of Shakespeare's poetry onto the Tribute text we wrote: "My bounty is as boundless as the sea, my love as deep. The more I give to thee, the more I have, for both are infinite." Also at the Schuster Heart Hospital, which is part of the Kettering Medical Center, we had the opportunity to create a fascinating combination History Wall and Tribute to inventor Charles Kettering, after whom the medical center -- and the town where it is located -- are named. The History Wall consisted of three sections and concluded with photos of Kettering's son, Eugene, and his much-admired wife, Virginia. Charles Kettering was the embodiment of American ingenuity. He is best known for his invention in 1911 of a push-button starter for automobiles -- an innovation that made it possible for women to drive without the help of a well-muscled man to turn the extremely stiff starter crank. By the end of his busy life, Kettering had filed 140 patents, risen to international prominence as an inspiring leader, and become a major philanthropist. In this History Wall, programmed and colored LEDs light up in sequence to convey a feeling of moving forward — echoing the result of Kettering’s many inventions and the forward-looking work of the Kettering Medical Center. We created a second and even longer Heritage Walk at St. Mary's Hospital, in a corridor adjacent to the Donor Recognition Art that I described above. This 100-foot-long carved and etched crystal Heritage Walk weaves together St. Mary's deeply held religious values with the story of its long and colorful history, told in archival photos, words and graphics. Deep, 3-D carved and chisel-cut letterforms and graphic elements "pop" almost holographically. Photographs -- ranging from archival pictures of pioneering nuns to recent pictures of a CareFlight helicopter -- are converted into dots and etched into the crystal using our DPI dither process. Because we are the deepest carvers of glass and crystal in the country, we are often called upon to create Art Glass installations that are desired for their sheer beauty. This year, we worked with the University of Notre Dame to transform an aerial view of their famous campus into a wall of crystal for their new Alumni Center. I wrote a blog post about this fascinating project in September -- check it out! The post includes a link to a time-lapse video showing us installing this 16-foot-wide mural. You'll find another fun time-lapse video in my blog about the chapel we created at Prentice Women's Hospital, which I mentioned earlier in this post. The non-denominational Mathews Chapel was built from unused office space, a fact you would never guess when you walk into this sacred space with its "acres" of blossoming almond trees, lit with soft pink LEDs. Lastly, I want to share with you two projects that we have been working on here in the Studio as a way of exploring design and fabrication possibilities. These graceful calligraphic explorations are a timeless translation of original copperplate engravings that were master’s exemplars of penmanship in 1780's. I think they look amazing rendered in carved crystal. If you've read this far, I commend you! You can see that we had a wonderful -- and very full -- year. Thank you for being part of it! Here's a really original idea for Donor Recognition! The Austin (TX) Statesman-American reported recently that 73-year-old philanthropist Sarah Butler, who led the drive to raise $1 million for the popular "Dino Pit" at the Austin Nature and Science Center, has been honored by having a newly identified dinosaur named after her! The bones of the 14-foot-long, 250-pound Jurassic-Period dinosaur were discovered in northern Arizona in 1997. They are estimated to be 190 million years old. Mrs. Butler is a major supporter of Austin-area arts organizations, including Ballet Austin and the Blanton Museum of Art, but I'm willing to bet she's never experienced Donor Recognition like this before! For the full (and very enjoyable) story, click here. This week I am at the National Catholic Development Conference in Chicago, where Catholic fundraisers from across the nation are gathered to network and find new and better ways of achieving their goals. We have done quite a bit of work for religious institutions over the years and we understand the deeply devotional nature of creating custom Donor Recognition and Tributes for them. But we also appreciate that nowadays even religious organizations find themselves having to compete for the attention of their audience and potential donors. I thought it might be useful for conference attendees to see a detailed example of this kind of Donor Wall, so our graphic designer Shuchi worked with our writer, Margot, to create a lovely little booklet showcasing the Donor and Heritage Walls we did last year for St. Mary's Hospital in Colorado. Shuchi has also put the booklet online so you can enjoy here. Its pages turn automatically, but by clicking on it, you can view the booklet in full screen, page back and forth, email it to others, or print it. If you'd like a professionally printed copy, just email us with your name and mailing address, and tell us how many copies you'd like. There's a quote we used in this project that applies to the dedicated men and women I am visiting with here at the conference, all of whom are striving in tight economic times to bring their good works to the attention of interested donors. and they will be capable of anything. P.S. The lovely sculpture pictured at the top of this post is actually a Donor Wall at Oaks Christian School in Westlake Village, California. Five overlapping panels of crystal, deep-carved by hand, are edge-lit by LEDs, literally illuminating the names of hundreds of donors that radiate from the central gold and white cross. This "Donor Wall" symbolically reflects the identity of this remarkably fast-growing school: It, too, dramatically “rises out of the ground.” For more on this piece, visit the Oaks Christian School page on our website. In a letter written to Christina Amri last summer, a longtime registered nurse talks about the effect of an Amri Donor Wall on patients and staff at his hospital. I saw your work for the first time last February at Community Hospital of the Monterey Peninsula, when you were just finishing up the installation of a crystal Donor Wall. I was on duty that day as a registered nurse specializing in palliative care, and stopped by the lobby to see what was going on. As the glass was revealed, it literally took my breath away. In the weeks to come, as I walked by the Donor Wall each day, I saw people pause, bow their heads or sit in reverence before the panel, even cry. Passersby touched it in wonderment, in memory of a loved one, or as a way of bringing them back to their bigger purpose as health care workers or members of a community. The theme of giving leapt off the glass to remind me of the importance of my work as a nurse and its true reward. I have moved since that day, but before I left Community Hospital I took a man facing a terminal diagnosis to see the Donor Wall. He cried at the beauty of it. Then he asked if I would bring him back to see it again. The spiritual nourishment that this piece of art provided him replaced the food he was no longer able digest. It gave him the courage to get out of bed the next day despite his dying body. This brief story speaks to the power of your inspired work. I cannot say eloquently enough how important your exquisite pieces are out there in the world. In its highest form, art reminds us of the sacred and binds us to life itself. If there was nothing of beauty, I would find it difficult to make sense of the often day-to-day grind of life, especially when working with the ill and dying. You and your team turn out striking work that touches the hearts and minds of thousands of people, as I have seen myself. Your beautiful wall in Monterey continues to touch people deeply. As a nurse, I thank all of you for the sake of the many patients and their families who are fed by your work. 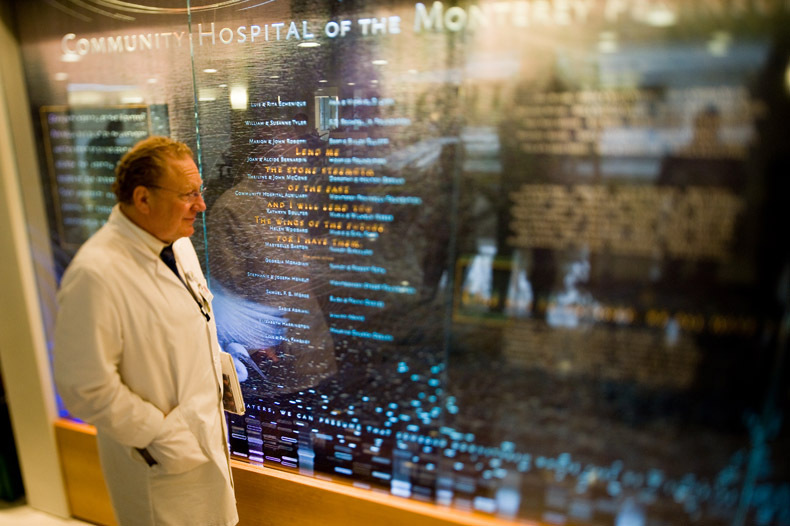 Note: I wrote in depth about the Donor Wall at Community Hospital of the Monterey Peninsula in an earlier post entitled "Designing Deep Meaning Into Donor Art." Also, the hospital magazine has written an article about their new Donor Wall. You can read it here. Yesterday we finished a delicate, demanding, and very rewarding project: Relocating an extensive 20-foot-long, 8-foot-high crystal Donor Wall, which we created in 2002-2003, to the second story of the elegant and airy new lobby of the University of Utah Hospital’s vastly expanded patient care pavilion. In addition, we installed a “sister” Donor Wall (above) to honor the generous people who helped fund the new lobby. In creating this new wall, we used the same materials –- carved crystal and gold-leafing -– the same theme and the same design vocabulary so that the two walls would have artistic unity. This quote also speaks to the diversity of people needed in a facility of this stature –- donors, medical professionals, support staff and volunteers –- and the dedication to helping others that unites them. 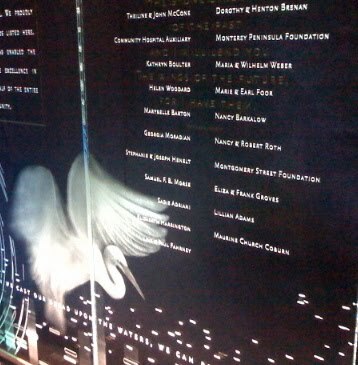 In fact, the original Donor Wall included the names of some 2,800 donors! Every single person who made a donation, from local philanthropists to the hospital janitor, was listed. The hospital’s new Donor Wall is 10 feet wide by 6.5 feet tall, and is located in a very prominent position, at the top of the escalator leading to the second floor of the beautiful 40-foot-high atrium. It is the first thing you see as you get off the escalator. In addition to the artwork and donor names it has some lovely inspirational quotes, including this one, which really touches my heart. the drops of one sea, the flowers of one garden." We were delighted to hear that the original Donor Wall was being retained despite all the new construction. As architectural artwork, it is so very unique and interesting. It has stood the test of time as a permanent monument and is well worth the effort of moving it. In addition, as the Major Gifts Officer we originally worked with pointed out to me yesterday, once you promise a donor that they will be permanently recognized, it’s crucial to keep that promise, even if the existing building undergoes renovation. 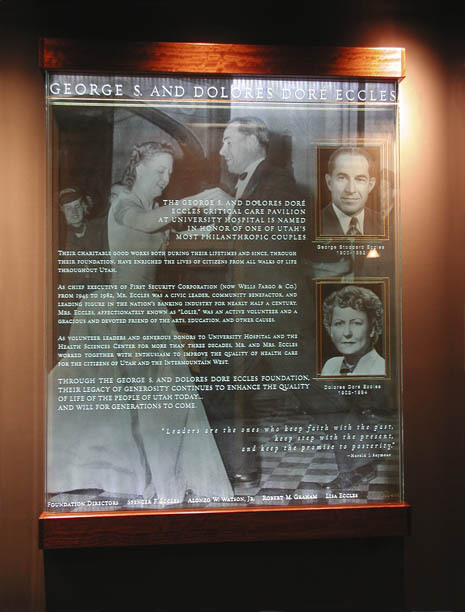 We also did a moving job (no pun intended) on a Tribute we created in 2003 for George and Dolores Dore Eccles. 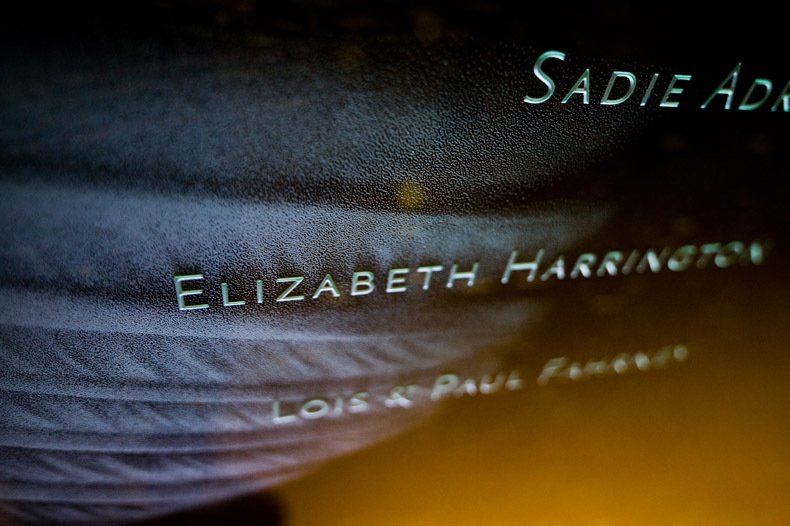 The Tribute uses formal, contemporary photos of the donors etched into a carved crystal panel that floats over a second crystal panel, which shows a warm and inviting image of the couple dancing together when young. This is one of my favorite Donor Tributes because it shows the two philanthropists as real people loving and enjoying their lives -– what a cheerful sight for any hospital passerby whose load may need lightening. 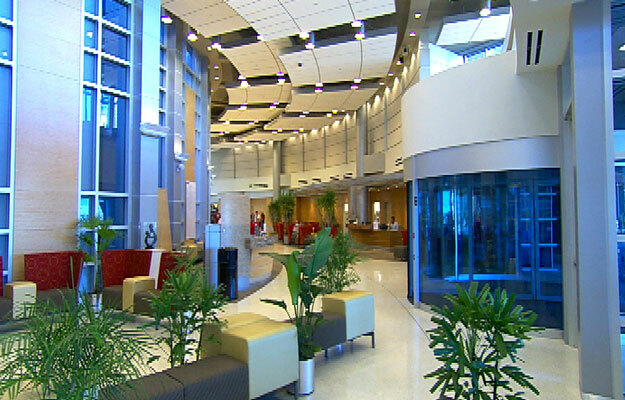 Note: The University of Utah Hospital’s new lobby is featured in a fascinating article in Medical Construction & Design magazine about the important role lobbies play in providing visitors with a warm and reassuring welcome. This is even more vital at the University of Utah Hospital, where some 10,000 people enter the lobby every day! "Real art -- as opposed to decorative art -- touches the soul and reaches the viewer emotionally. 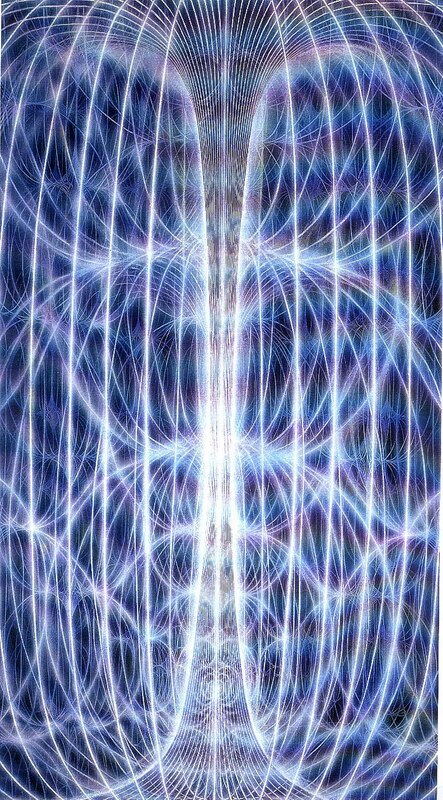 It expresses energy, life force, and has deep spiritual meaning that can help the viewer transform pain and suffering to reach a higher state of consciousness." When my team of graphic designers and I begin a carved crystal Donor Wall, we approach the work as artists. We are not looking to create something that is merely pretty. We are creating real art, so we start by focusing on the deep meaning of the piece, and we choose for images and symbols that will convey that meaning. Of course, we also add straightforward elements -- a formal appreciation statement, donor names and giving levels, and inspirational quotes. But often the silent language of the symbolism speaks as loudly to viewers as the literal words we carve into the surface of the crystal. This is because we choose symbols and images rich with associations to our cultural and spiritual history. 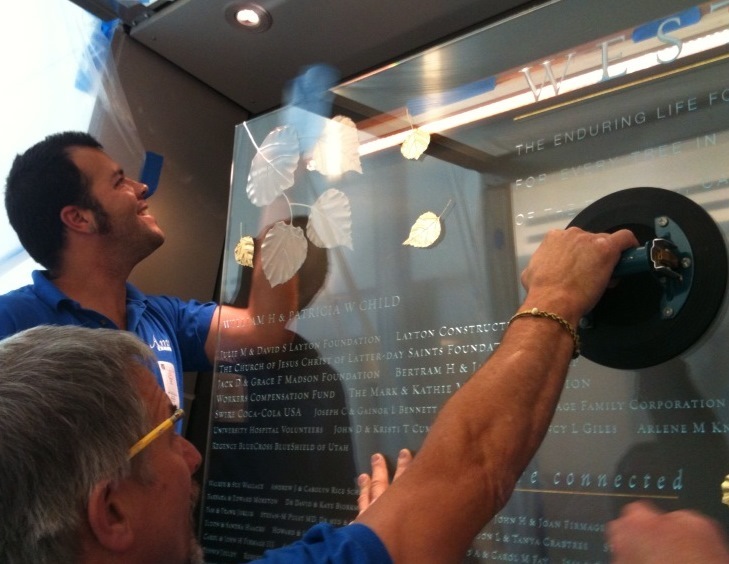 A good example of how we design deep meaning into our art glass is our recent installation of a Donor Wall at Community Hospital of Monterey Peninsula. Let me show you that mural and walk you through why we chose the images and symbols you’ll see. The process began when Amy Goodman, curator for the hospital’s extraordinary art collection, CEO Steve Packer (far right), Foundation head Al Alvarez (far left), and hospital Board members engaged in a very thoughtful dialogue with designer Arlene Rhoden and myself as artists. At first glance, the 10-by-18-foot wall of carved and etched glass appears to be simply an image of Monterey Bay, its blue waters sparkling with sunlight and a snowy white egret lifting into flight on the left side of the mural. Had we been designing this wall for display in a private home, a scene of great natural beauty might have been enough. But to create a true work of art, there must be a deeper meaning. In this case, our Donor Wall needed to symbolize the dedication, skill and vision of the hospital staff as well as the caring, vision and generosity of its donors. The wall, to be situated in the main lobby of the building, also needed to set a positive and reassuring tone for patients and their families entering the hospital. Thus, we chose to portray the serene, light-dappled waters of Monterey Bay. Water symbolizes healing (the hospital’s role), it is life-giving, it nourishes our body and spirit. Water is an important symbol in most spiritual beliefs, Western and Eastern alike. In the Judeo-Christian tradition, God is called "the fountain of living waters." In addition, water symbolizes wisdom (a reference to the skill of the medical staff). 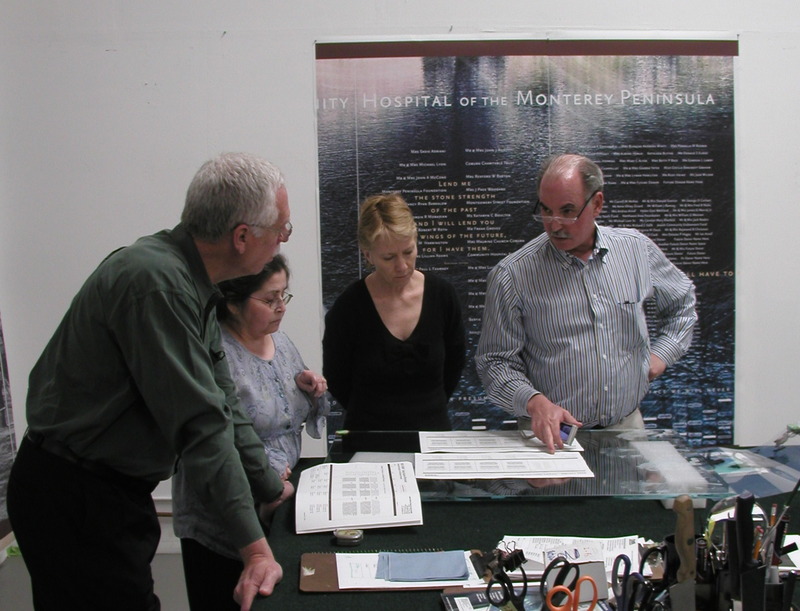 At Community Hospital of Monterey Peninsula, water is also a key feature of the physical environment. Ponds and fountains provide refreshing and relaxing elements inside and outside the buildings. For all of these reasons, we chose to use an expanse of water as the background for our Donor Wall. will profit from that grantor’s gift. Next we wanted to bring in symbols signifying the latest scientific discoveries to express the hospital’s joint mission of compassionate care with cutting-edge medicine. Across the foot of the mural we added short columns of bars, which are stylized images of DNA fragments that have been separated and sorted by size, an essential first step in a creating a genetic profile of an individual. These floating bars morph beautifully into the patterns of light dappling the sunlit waters. And, because DNA contains our inherited genetic code, this imagery also symbolizes the passing of gifts from one generation to another -- from the hospital’s community leaders and generous donors of the past to those of the future. Lastly, these bars or boxes serve to mirror the distinctive decorative features built into the hospital by its original architect, the renowned Edward Durell Stone. On the left of the mural, we added the image of an egret spreading its wings either to land or take flight. Incorporating a living creature into the scene brought life, warmth, and a sense of scale to the Donor Wall. It helps viewers connect with the entire mural. Symbolically, birds stand for hope, an important subconscious message for patients and their families. Birds also soar, and the upward movement of the bird portrayed here implies the soaring of thought, spirit and imagination. Last of all, and I confess it will be hard to show you here, is the symbolism in the colors and timing of the lighting system we programmed. Soft, multicolored LEDs illuminate the crystal panels in a subtle four-minute cycle patterned after the 24-hour cycle of a day. It begins with the pinks and yellows of sunrise, moves into the brighter light of day, then softens into the turquoise of sunset and the cobalt blue of nighttime. (If you click on the side-by-side image above, you can best see the colors shift in the curving lines at the upper right. )The lighting never shuts off, just as the work of Community Hospital never ends. 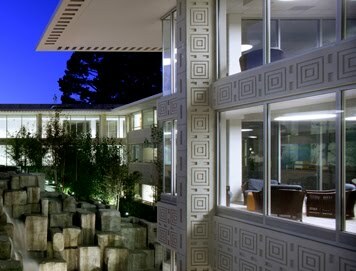 Both continue day and night, providing healing, inspiration and solace for all who visit. True art, unlike mere graphics, works on many levels. It communicates explicitly and implicitly. It thanks, honors, recognizes, and acclaims. It inspires and it comforts. It touches on our shared history and points toward a mutual and positive future. This is our goal for every work of Donor Art that we create. P.S. Jain Malkin, whose quote I used at the beginning of this post, is working with us right now on an amazing project. Stay tuned to see what we do with the interactive Kettering Tribute at the beautiful new Schuster Heart Hospital in Kettering, Ohio.